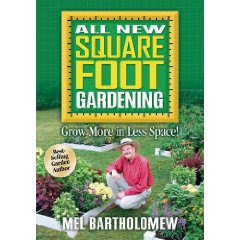 Next in our series on Square Foot Gardening I want to write about garden structures. 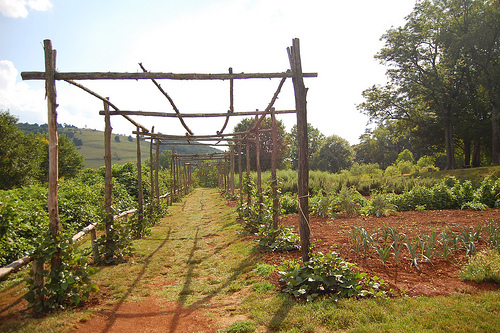 You won't need anything this elaborate in your first garden, but it's definitely a good example of a garden structure. 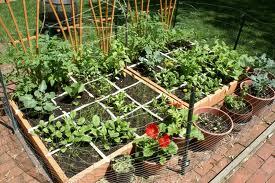 Once you have your beds built, filled and planted, the next consideration is giving your plants support. If all you are growing is a salad garden, herbs, or other bushy plants, you don't really need one. 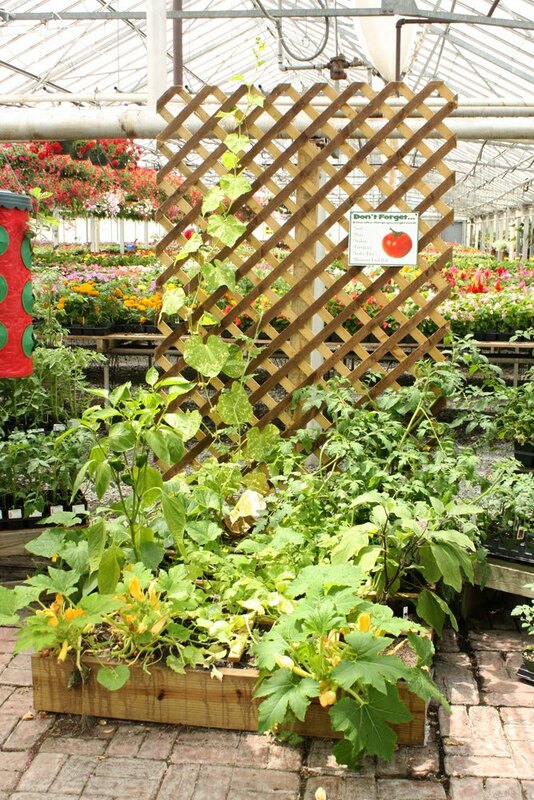 But things like tomatoes, cucumbers, and other climbing plants do need some kind of support. You could start out adding a climber to your bed when you build it, or you can add it later, once you decide what you want to grow. Either way will work. The simplest solution is to just build a frame from the same wood you use for your spacers, as shown in the illustration above. 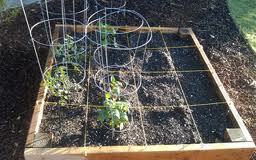 You can either string it with garden string, or you can buy ready-made netting to attach which would be easier. 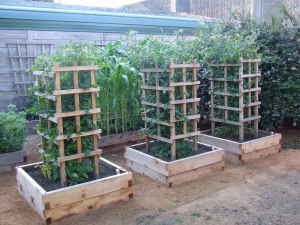 You can also just use ready made climbers from your garden centre and attach them to the side of your bed. Here is another example. 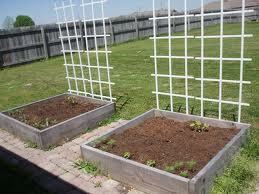 These are usually used for flowering vines but they work just as well for vegetables providing you secure them well. 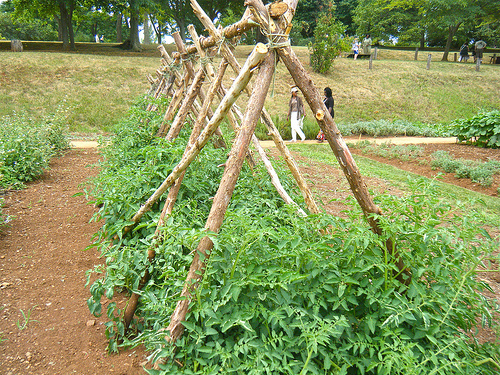 In this example they used fencing which would work also. It would require some kind of support to keep it up however. 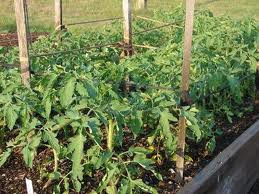 If you are growing tomatoes you will need some kind of support for each plant. 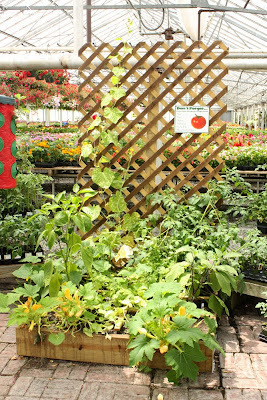 The easiest is to buy tomato cages like the ones above from your garden centre. They only cost a few dollars and can be reused year after year. Some people prefer to make their own cages, and there are many variations to be seen. The one above uses string to create the support. Here they have built a teepee like structure. However it really doesn't do a very good job of containing the plants as one can see. This version is a lot more successful, but still not perfect. The plants are all contained but getting in to prune and harvest will be a challenge. 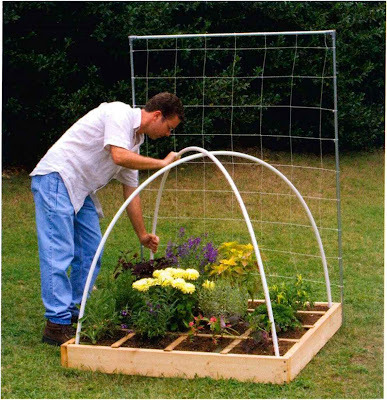 At http://selfreliantnetwork11.blogspot.ca they show you how to construct a protective dome out of PVC pipe which is available at all hardware stores. This might seem like a lot of trouble but in fact it can save you a lot of time and effort once you have set up your dome. In the spring you can cover this frame with plastic to create a mini greenhouse that will protect your plants from any late frost. 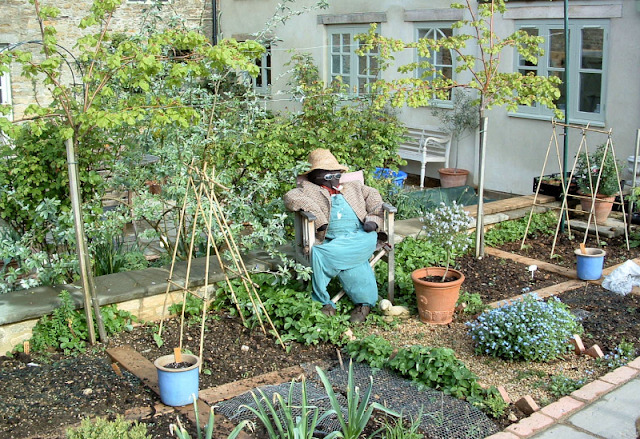 During the hot summer months you can cover it with shade cloth which will prevent your salad greens from bolting and becoming bitter. 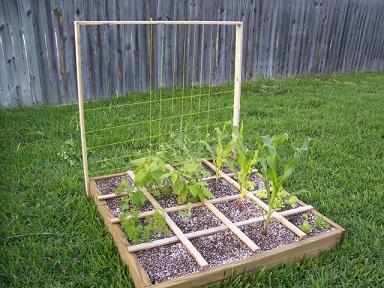 And all during the growing season, if you have a problem with wildlife trying to share your garden, you can cover it with chicken wire to keep your plants safe from predators. In fact if insects are a problem you can cover it with mosquito netting. This will still allow sun, air and rain into your garden but keep the bugs out. Creating this dome is really very simple and well worth considering. 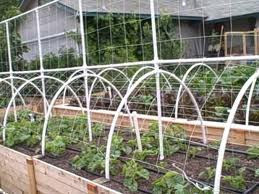 Especially if you have a larger garden as in the example above, protecting your crop from the elements and preditors can, in the end, save you a lot more time and effort than what it will take to set up these supports. Here are a few videos that show you step by step how to build structures.